Point Lookout is a hamlet and census-designated place (CDP) located in the town of Hempstead in Nassau County, New York. The population was 1,219 at the time of the 2010 census. The town, majority residential homes, contains several small-business' on Lido Boulevard. The town surrounded on 3 sides by water, has restaurants along the bay, that are very popular for beach goers during the Summer months.GeographyPoint Lookout is located at the east end of Long Beach Barrier Island. It is adjacent to Lido Beach, which in turn abuts the city of Long Beach, to the west. Point Lookout covers a total area of 0.2sqmi.Long Beach Barrier Island, which lies between Reynolds Channel and the Atlantic Ocean, was originally formed by glacial deposits and includes a variety of bays, dunes, ponds, marshes, and ocean shoreline, which supports a complex ecosystem that includes a wide variety of flora and fauna. Jones Inlet separates it from Jones Beach Island.DemographicsAt the time of the census of 2000, there were 1,472 people, 616 households, and 413 families residing in the CDP. The population density was 7,379.7 per square mile (2,841.7/km²). There were 792 housing units at an average density of 3,970.6/sq mi (1,529.0/km²). The racial makeup of the CDP was 97.42% White, 0.41% African American, 0.48% Asian, 0.88% from other races, and 0.82% from two or more races. Hispanic or Latino of any race were 2.11% of the population. Point Lookout is in Long Island. 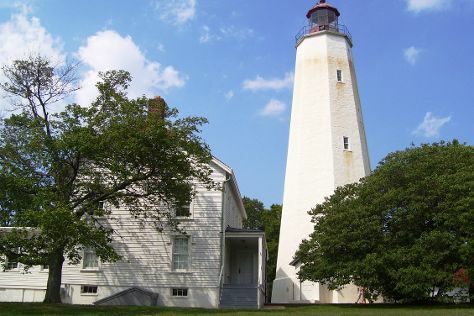 Explore the family-friendly attractions of Point Lookout and add them to your vacation plans using our United States road trip planning tool .